The Designer tool using the neural network generates new presets based on already existing by adding some random variations and checking the result so that the new preset remains similar to the selected pattern. In this update added a new tool Designer (only for iPad, for iPhone in the next update) that is intended to automatically generate and tweaking new presets and scenes. With using neural network the Designer generates new presets based on already existing by adding some random variations and checking the result so that the new preset remains similar to the selected pattern. Also in this update – New scenes, presets and samples, Audiobus SDK updated, Built-in description updated, Minor bugs were fixed. ● Three layers for each oscillator. ● Six voices for each layer. ● Six low frequency oscillators. ● Separate arpeggiator for each oscillator. ● Designer tool for generate scenes and presets (iPad only). ● General processing of level, balance, LPF, HPF for each layer. ● Three slots for filters and effects after each oscillator. ● Twenty additional selectable filters and effects. ● Set of different kind of filters and effect modules. ● Spatial mixer with two different sound space. ● Screen keyboard adapted for continuous drones and soundscapes. ● Predefined set of keyboard scales and custom scales. ● Full screen, double and split features for screen keyboard. ● Options of screen keyboard for pitch, continuous, modify, velocity. ● Supports for two virtual and two MIDI keyboards at the same time. ● Flexible assigning keyboards and controls to the oscillators. ● Two main effects controls can combine several parameters. ● Uploading samples thru Dropbox, Web access, clipboard. ● Auto and manual tuning of samples with frequency analyzer. ● Set of predefined and ready-to-use scenes and presets. ● Built-in library of samples of instruments, synths, noises, etc. ● Possibility to pack and share scenes and samples as single file. ● Supports loop points and note info in wav files. ● Detailed application description (built-in and PDF file). ● Inter-App audio compatible (with transport and BPM controls). 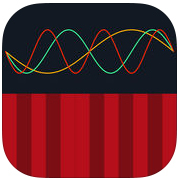 ● Supports Audiobus 3 with “State Saving” and MIDI features.